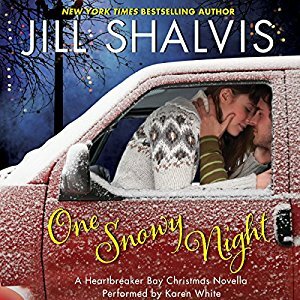 One Snowy Night was a potentially sweet and fun little romance, with a road trip in snowy weather, and some thought-provoking ideas about forgiveness, change, growing up... the works. Rory and Max were both nice characters, although they don't really stand out all that well. Rory is the typical, down-on-her-luck girl, who has had a rough go of things, who is trying to get her life back together and make amends with her past. Max is Standard Broody Alpha Male #1, who is also letting things in his past influence his decisions in present day. To be honest, the conflict between Rory and Max was a rather legit, realistic issue. The biggest problem that I kept seeing was that the two didn't know how to talk to each other. Max is pissed at Rory for some reason, Rory has secrets she doesn't want to talk about. And thus, it makes for a very lonely, and quiet car ride, when neither of the two want to talk at all about anything. I got a little frustrated when Rory realized that something big was bugging Max that had to do with their high school years. He didn't want to talk about it, and so Rory decided that she wouldn't ask him, despite the fact that she really wanted to find out why Max had a chip on his shoulder about her. And thus, that carried on for a bit of time and made me roll my eyes. Because, yes, let's just NOT talk about what the problem is and let it fester while the two of you drive for a few hours together in the wintry blizzard. My feelings of relief was palpable when some nice old couple gave Rory the tip that she needed to look to the past to figure out how to fix her present. I probably would have just told her that she just needed to learn to talk to Max, and vice versa, but I guess the old lady put it in a more worldly way. Anyway, this is a cute little romance, probably not something I'd come back to. Unless there's more of Carl, the big and goofy doberman to see; now HE was probably the best part of the book!